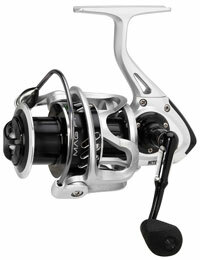 First series of reels into the MAG PRO family. This series is taken back all principle advantages. The body is made from the famous GV5H material, lighter and stronger than conventional material. Gear is made from Brass material and Main shaft is machined from Stainless Steel material. This series is having machined anodized aluminum handle with EVA knob, light and comfortable.  Nitrile Sealed Hybrid Carbon Drag System.  Machined Aluminum Anodized Handle.  GV5H Body and Rotor.  Aluminum Anodized Spool and spare spool.